Make angels with these filigree pieces, cabochons and beads. 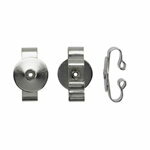 It is important to pay attention to whether the connecting loop is positioned "horizontally" or "vertically" and coordinate this to the placement of the drilled hole in your pendant drop. Also see Tubes with Loops under METAL BEADS. 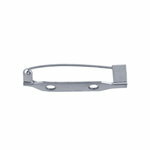 Glue, solder or rivet ornaments onto these spring-hardened steel barrettes. These French-style barrettes are measured end to end across the top surface. The 80mm (3 1/4") style is the most popular seller. Made in the Orient. Bead caps are used to cap one or both ends of a bead, thus adding more detail and texture to the design of the piece. Gold-plate, imit. rhod. 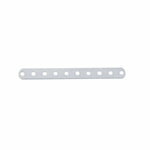 plate (nickel color), silver tone, copper (shiny or antique) tone, gunmetal tone, brass oxidized or antique gold tone, pewter, and sterling silver. Bead caps may also be used to finish off the ends of bead-woven ropes, or multiple-strand pieces, to hide the knots or mess, and give the ends a finished look. These are also called "Knot Covers"
Now in Antiqued Copper and Gunmetal, as well. Use E6000 to glue these onto a tumbled stone, crystal point, or any other item, to make a pendant. You will also need to add a jump ring. 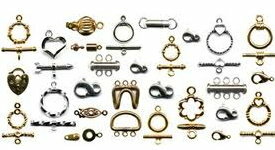 A wide selection of clasps, including lobster claws, spring rings, toggle clasps, magnetic clasps, s-hooks, hook & eye clasps, choker clasps, multi-stand clasps, slide clasps, lanyard hooks, barrel, coil, foldover, pearl and safety clasps, necklace enhancers, clamps, coil ends. Includes shapes with multiple loops attached in two or more places, or shapes with many openings from which to attach things. Also include Figure 8 shaped pieces. 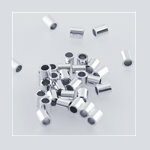 Use Crimp Beads or Tubes to finish off Tigertail or Soft-Flex wire projects. 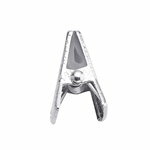 Flatten the crimp bead with chain-nose pliers or crimping pliers . 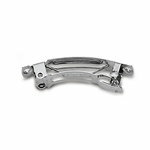 We most often use the 2mm round crimp or 2mm tube crimp. 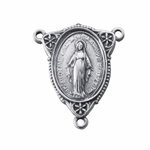 Available in silver-plate, gold-plate, nickel-plate, black, gunmetal, copper, brass oxidized (dull), sterling silver and gold-filled. 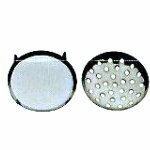 Use Crimp Bead Covers to hide the crushed crimp beads. Simply squeeze the cover over the crimp, using a crimping or other pliers. 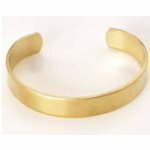 These come in differnt sizes, different metals and finishes, and different textures. 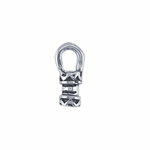 Use Horse Shoes (wire protectors) to hide and protect the cable wire that loops into and around the clasp at the point you crush the cable wire. 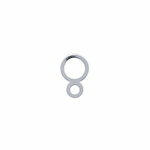 This also forces you to leave the correct size loop between the crushed crimp and the clasp or ring. Will work with cable wire that is .019" or thinner. 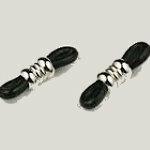 Finish your cord jewelry with these stylish crimp ends! 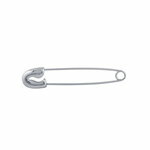 They're ideal for use with leather, rubber and satin cord. Add a little glue, like E6000, to your cord. Push the cord into the crimp end. Simply crimp the center with round-nose pliers to secure the cord in place. Handcrafted in Indonesia and Israel. Designs may vary slightly. In Sterling Silver, Anti-Tarnish Brass, Red Bronze, Copper Plated (shiny), Gunmetal. 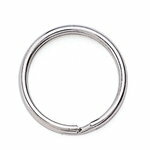 Sterling silver and gold-filled bead hoops have a loop at one end. Slide beads onto the hoop, then bend the straight end of the hoop outward to create a hook. 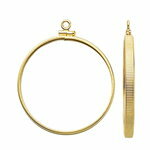 Gold-plated and nickel-plated bead hoops have a stamped hole in one end. Slide beads onto the hoop, then bend the straight end of the hoop outward, so it catches the hole through its bottom. Some people use these for wine glass charms. Only the sterling and gold-filled ones can be washed. The plating will come off the plated ones, when washed. Create multiple strand necklaces and bracelets. The length of the"space" between connecting loops is identified in the item descriptions. 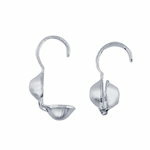 You can also use these pieces to make earring dangles, to get multiple drops or cascading drops looks. The regular thickness for eyepins is 20- to 21-gauge. You'll find that gemstone beads often will require extra thin eyepins, usually 22-gauge, 23-gauge, or sometimes as thin as 24-gauge. 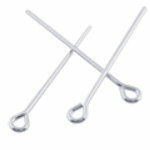 Also, eye pins, head pins, jump rings and ear wires in Argentium -- a tarnish resistant sterling silver! Attach a cord or string of beads to these eyeglass holder ends. Typically the length of the string or cord will be 20-30", 22" is the most common length. ALTERNATIVE DESIGN OPTION: For those pieces that are made up of a round rubber thong and coil, you can modify this design by replacing the coil with a 6mm roller bead (see under GLASS), to create different colors and looks. 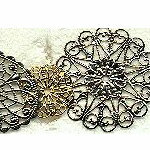 Jewelry designers use these stamped and filigree pieces to create "collages" to be used as pins, pendants or earrings. These are glued together and glued on to. Your imagination is your only limitation. 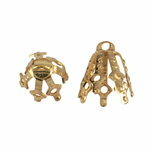 You can also use jump rings to create a chain of 2 or more filigree pieces to make long dangling earrings. Off the holes and loops on these pieces, you can add beads and crystals as tiny, sparkling drops. 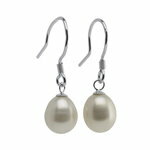 This style of earring is called a chandelier style. 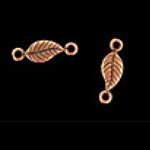 Costume charms are typically brass which has been plated. 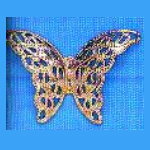 Land of Odds offers a limited selection of stampings, costume charms and filigrees at this time. These are available in several finishes. If you use glue, don't use superglue. Superglue dries like glass, so when the piece is dropped, or hits something hard, the glue-bond will shatter like glass. Use a hot glue gun or an epoxy glue. Don't use a hot glue gun for pieces that will touch the body, because body temperature will weaken the glue bond. 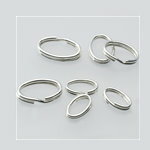 French Wire Bullion is a tightly wound metal coil that is often used at the end of pearl-knotted necklaces and bracelets to add a more finished look and attachment to the clasp. 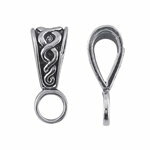 It protects the thread where it comes into contact with the clasp. It is a hollow tube made up extremely narrow wire coiled together tightly, and it resembles a very small slinky with a tube diameter of a few millimeters. 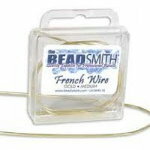 French Wire comes in four sizes (fine, medium, heavy, extra heavy) and in gold-plate, silver-plate, copper-plate, "new" gold colors, as well as sterling silver. We sell the Fine and the Medium the most. 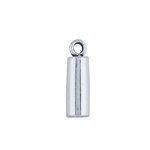 This bullion may also be snipped into small "tubes", and used as flexible, bendable "bugle beads", on a necklace or in a beaded embroidery pattern. Read About How To Use French Wire For A Professional Look . ...under our KITS and CLASSES sections. The stems are 18 gauge wire (1mm). 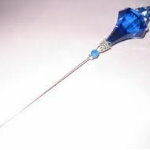 Slip beads over hat pin stems and secure with crimp beads (2mm) or glue. 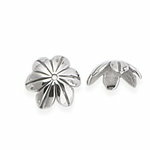 These work well with our East Indian lampwork beads. 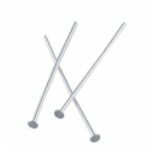 The regular thickness for headpins is 20- to 21-gauge. You'll find that gemstone beads often will require extra thin headpins, usually 22-gauge, or 23-gauge, and sometimes as thin as 24-gauge. The sizes we use the most are the 4mm and 7mm in a regular thickness (between 24gauge and 18gauge). 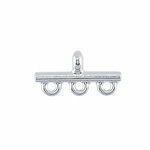 Our sterling link locks jump ring lets you add charms and join jewelry compoents together with perfect confidence. The trick is always how to get the two rings apart, and hold them apart so you can slip something between them. You can use your fingernail, a single-edged razor blade, or a Split Ring Pliers. Includes regular and heavy duty deluxe styles. Also see our Brooch Converters under FINDINGS. 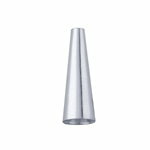 The spokes form is available in 9", 6", 4.5" or 3.75 " diameters. 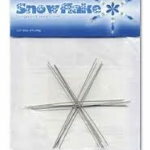 NOTE: The length measures the full width of the snowflake form, NOT the length of each spoke. 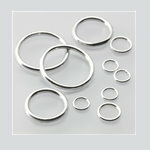 These rings come in different sizes and shapes. They do NOT have a gap in them. 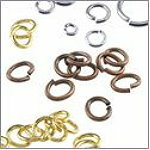 Split rings are connectors like jump rings. They look like miniature key-rings, and as such, they are more secure than jump rings. - "Gold Filled" vs. "Gold Plated"